NEW DELHI: Foreign direct inflows into India rose 3 per cent to $62 billion during 2017-18, the slowest pace of expansion since the Narendra Modi government came to office four years ago. 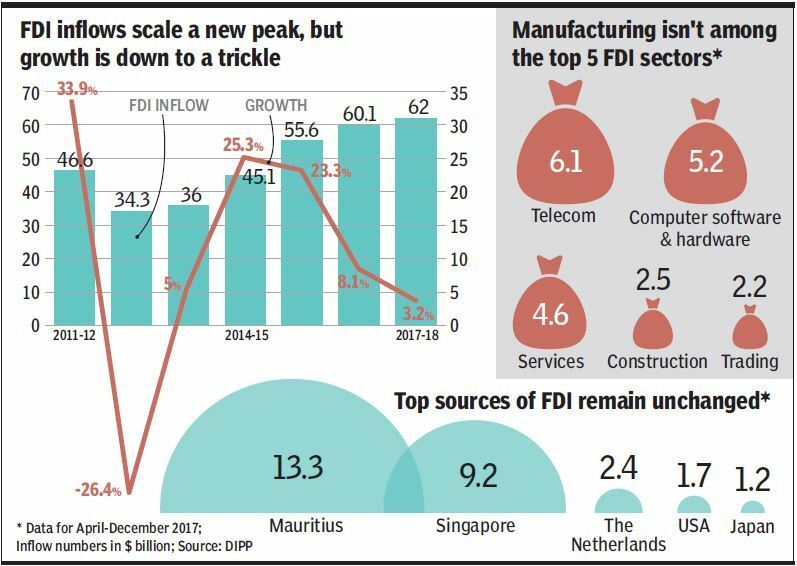 FDI inflows during the previous financial year were estimated at a shade over $60 billion. The slowdown in growth in FDI flows is bad news given that domestic private investment has remained muted, which commerce and industry minister Suresh Prabhu said was on account of surplus production capacity that was now getting used up. He said that during the four years of the Modi government, foreign inflows jumped to $223 billion from $152 billion in the previous four-year period.